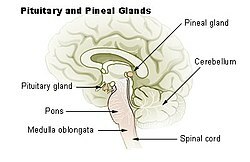 The pineal gland, an aa kent as the pineal body, conarium or epiphysis cerebri, is a smaa endocrine gland in the vertebrate brain. It produces melatonin, a serotonin derived hormone, which affects the modulation o sleep patterns in baith saisonal an circadian rhythms. ↑ Macchi M, Bruce J (2004). "Human pineal physiology and functional significance of melatonin". Front Neuroendocrinol. 25 (3–4): 177–95. doi:10.1016/j.yfrne.2004.08.001. PMID 15589268. ↑ Arendt J, Skene DJ (2005). "Melatonin as a chronobiotic". Sleep Med Rev. 9 (1): 25–39. doi:10.1016/j.smrv.2004.05.002. PMID 15649736. Exogenous melatonin has acute sleepiness-inducing and temperature-lowering effects during 'biological daytime', and when suitably timed (it is most effective around dusk and dawn) it will shift the phase of the human circadian clock (sleep, endogenous melatonin, core body temperature, cortisol) to earlier (advance phase shift) or later (delay phase shift) times. This page wis last eeditit on 21 November 2015, at 17:00.